One of the pandas. Keep on gnawing buddy. Image courtesy of the Toronto Zoo. In the first wave of results for this column’s freedom of information requests I’ve learned a few things. Among these lessons are international panda politics. The FOI Raccoon column launched a little over a month ago with three Freedom of Information (FOI) requests about city issues: the opioid crisis, City Council’s controversial flip-flop on ranked ballot voting, and the beloved Toronto Zoo pandas. If you’d guess the panda request would be the most fraught, you’d be right. We received meaningful, heartbreaking information concerning Fentanyl and tainted drugs in Toronto, as well as some useful background information about the ranked ballot debate. But we’re going to have to wait months to see the medical records of Toronto Zoo’s pandas, if we ever do. In the spirit of transparency, and public service—that’s what this column is all about!—we’re going to post all our FOI results when we get them in. Torontoist requested all of Toronto Public Health’s reports concerning tainted opioids and/fentanyl, since Jan. 1, 2016. The information co-ordinator who responded was helpful, and modified the request to specifically include reports from ReportBadDrugs.ca, a website where drug users or people who know them can report adverse reactions to Toronto Public Health (TPH). In turn, TPH warns the public about bad drugs going around. The idea behind the request was that as the City debates supervised injection sites (a three site pilot project just earned council’s approval) and other harm reduction measures to combat the growing problem of opioid overdoses, more information is better. The first part of the release was the ReportBadDrugs.ca database itself, which we’ve uploaded and you can view here. It contains entries about multiple deaths from heroin, sold in March of this year as “China White” that was suspected to contain powerful opioid Fentanyl. The entries are made up of small blurbs about what happened. For instance, one entry was submitted by a friend of a middle-aged woman who died at her home in the city’s east end. “Speculation that the heroin is cut with Fentanyl, however I think she died because she had lost her tolerance. Or this may be a combination of losing tolerance and injecting too big a hit. A tragedy none the less,” the friend wrote. A young woman, whose family didn’t know she used, was found dead. A young man died in bed with his partner. The database entries are more personal than the statistics that TPH has made publicly available in the past—but they’re not the complete picture. Adding to the database is voluntary, and the vast majority of overdoses aren’t entered into it. Shaun Hopkins, manager of TPH’s needle exchange program, ReportBadDrugsTo.ca is TPH’s main source of information gathering on adverse drug reactions. 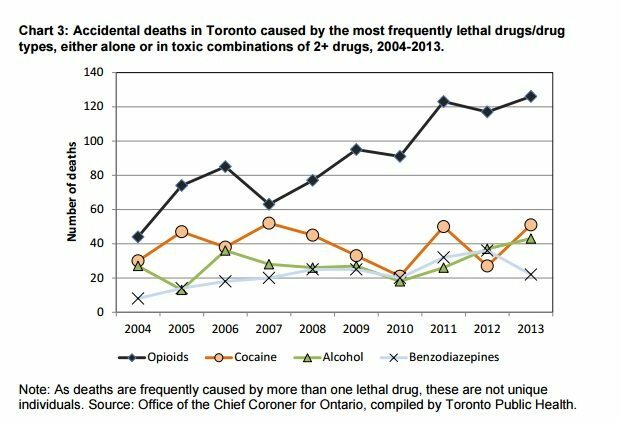 TPH doesn’t get information from police or emergency services, and there is no real-time monitoring of drug overdoses adulterated drugs in Toronto. Using anecdotal reports, TPH sends out alerts to drug users when it suspects there is an adulterated or unusually potent drug going around, which warns users to avoid certain drugs or unknown dealers, or to monitor their dosages, she said. “Anything we do in this area is to get information back out to people who use drugs so they can make knowledgeable choices about what they do,” Hopkins said. An effective early-warning system about Fentanyl or unusually strong heroin in the city could save lives, she added. Hopkins said there have been plans to share drug information between emergency services and public health bodies in Ontario, but they haven’t come to fruition. She pointed to a report released last July by the Municipal Drug Strategy Network of Ontario, which called on the governments of Ontario and Canada to implement real-time reporting of drug overdoses, to prevent needless death, and criticized the lack of action on that so far. Hopkins said everyone needs to be concerned about overdoses, and added she was glad to see media interest in the issue. Torontoist asked for all of the emails between Justin Di Ciano (Ward 5, Etobicoke-Lakeshore), the mayor, and other councillors, about his surprise motion to rescind the city’s support for ranked ballot voting, passed last fall, and presentation he made at a provincial committee about ranked ballots earlier this year. The FOI revealed an email thread between his office and city staff about his presentation at Queen’s Park, but no records concerning his surprise 2015 motion were found. The councillor wasn’t available for an interview this week to discuss it. Normally, a public body in Ontario has 30 days to fulfill an FOI request. But sometimes, complicated requests require an extension of 30 days to complete. Like everything with pandas, their FOI requests are extra, quadruply complicated. Our request for the Toronto Zoo’s pandas medical records has been delayed 120 days. 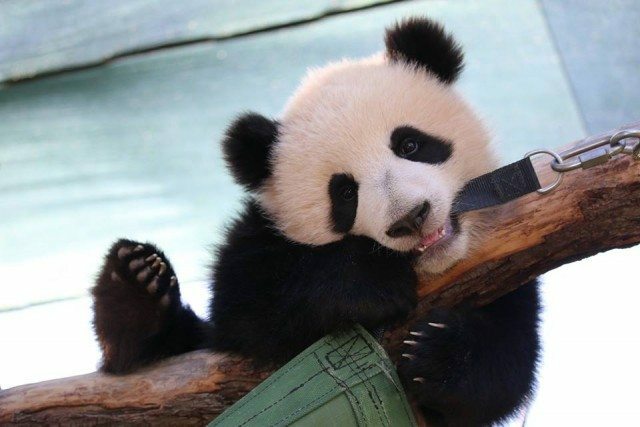 The Zoo says it needs this extra time to consult with the owners of the pandas—the Chinese Association of Zoological Gardens—and the Calgary Zoo, which is the third partner in the panda tri-partite agreement. Here’s the official letter, telling Torontoist what TTC Chair Josh Colle had previously said about not having any emails in his accounts regarding SmartTrack and GO RER.